The Strange Dual Inline Master Cylinder is ideal for Sportsman classes requiring four-wheel braking. Assuming rear wheels have 4-piston calipers, the 1.032" bore master cylinder should be used when single or 2-piston calipers are on the front two wheels. For vehicles with 4-piston calipers on the front two wheels, the 1.125" bore master cylinder allows optimum volume and pressure. Will this work on a 79 Chevy 10? I am deleting the brake boster to run upright headers. This is a universal master cylinder, you will need to make the modifications to install it properly. Will this work for a 95 s10? 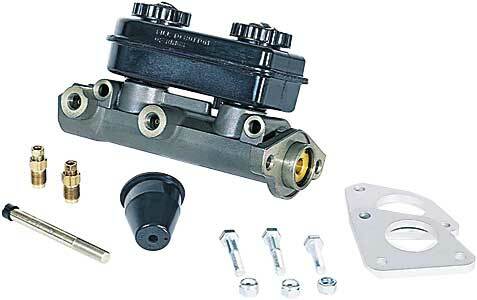 This is a universal racing master cylinder and will require modification to fit your application.